Suddenly, the Masters of the Universe were staring at their worst nightmare: the prospect of a comeback by the only major politician in the U.S. whose deeds -- and not simply words --prove that he does not think corporate titans are too big to jail. To review some things Spitzer warned about...."Several years ago, state attorneys general and others involved in consumer protection began to notice a marked increase in a range of predatory lending practices by mortgage lenders. Some were misrepresenting the terms of loans, making loans without regard to consumers' ability to repay, making loans with deceptive "teaser" rates that later ballooned astronomically, packing loans with undisclosed charges and fees, or even paying illegal kickbacks. These and other practices, we noticed, were having a devastating effect on home buyers. In addition, the widespread nature of these practices, if left unchecked, threatened our financial markets." The administration accomplished this feat through an obscure federal agency called the Office of the Comptroller of the Currency (OCC). The OCC has been in existence since the Civil War. Its mission is to ensure the fiscal soundness of national banks. For 140 years, the OCC examined the books of national banks to make sure they were balanced, an important but uncontroversial function. But a few years ago, for the first time in its history, the OCC was used as a tool against consumers. You cannot currently send a star to Kit because you have done so within the last day. Thanks J.L., and thanks Kit for the article excerpt and reference to that article, which was written by Spitzer in Feb. of 2008. I did read the entire article. The actions of the Bush administration and the big bankers is clearly a systematic way to faclitate a redstribution of wealth, and a stripping away of the states' authority to do anything about it. It's quite outrageous. Eliot Spitzer tried to be a Wall Street slayer and attempted to make them responsible for all the Ponzi schemes. He made a few enemies who kept him from doing his job. Sorry, can't currently give stars to Kit and Judy. Thanks Kit for that extra info. 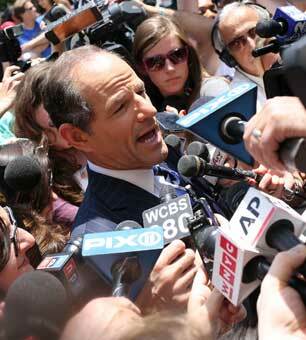 Don't like Spitzer as a person but gotta admit he tried to do something, it's just too bad he ahd to be such a pervert. Article noted with thanks. Spitzer is a disaster that needs to go away. Thanks Judy. In fairness though he was kept from doing anything meaningful thanks to the Bush administration, but he could've tried harder to push back.